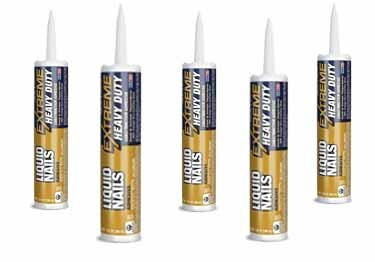 Liquid nails Heavy Duty Adhesive creates flexible, impact-resistant bonds for demanding indoor and outdoor projects. 10oz cartridge covers 32 linear feet. 10oz cartridge covers 32 linear feet. I would like to know if your product liquid nails #a419 is the same as liquid nails ln-950? we are attaching b-board to a block wall with this product and it keeps coming loose the sheets are 4 x 8 like paneling, any ideas ? From counter tops to concrete, liquid nails Heavy Duty Adhesive creates flexible, impact-resistant bonds for demanding indoor and outdoor projects. Did not believe it would work but it really foes. this product is perfect for securing kick plates! sets quickly and holds permanently. Perfect match for lots of the great metal products offered here!